Expanding our bee family, that is. Don’t want anyone to get confused! We acquired 2 more hives and now have a total of 5. Yay! A laying worker is a worker bee that lays unfertilized eggs in the absence of a queen. 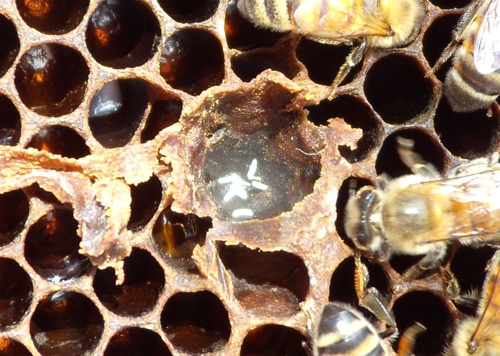 Only drones (male bees) develop from the eggs of a laying worker because drones only have one set of chromosomes from the mother. This is one sign that you have a laying worker in your hive and that the hive is queenless. You can see multiple eggs in a single cell. This particular hive we knew was queenless because we were trying to let the hive rear a new queen, but they were unsuccessful. We bought a queen and introduced her to the hive. All is well now.